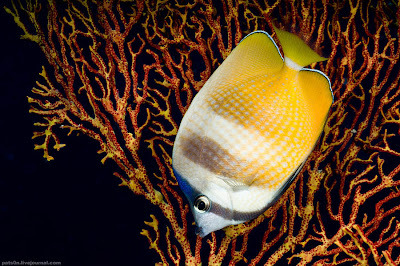 I just realized that I'll still be absent during the 2008 Great Fiji Butterflyfish Count, of which we are a proud Participating Resort. For Eroni, our brand-new resident (and proudly Fijian-born and -trained!) Marine Scientist, this is the first of an upcoming series of initiatives aimed at educating the public and consolidating the support we have in the community. Welcome aboard Roni, and all the best of success!!! And for you out there: come and join in!!! Yes, I know, I've signed off - but this was just too good to give it a pass. Talking about DEMA -well, sort of-, the 2008 Ig Nobel prizes have just been awarded, among which this inimitable insight. Apparently, lap dancers earn the most when they're, you know, most fertile! The Ig Nobel-winning experiment probing human nature has been featured in New Scientist: can women somehow signal when they are at their peak fertility? 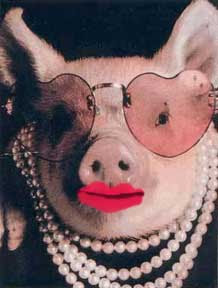 Most other female mammals do so openly, but men don't consciously recognise any such signal from women. In the 18 subjects Miller studied, average earnings were $250 for a five-hour shift. That jumped to $350 to $400 per five-hour shift when the women were their most fertile, he said. "I have heard, anecdotally, that some lap dancers have scheduled shifts based on this research," he said. You may want to keep that in mind, lest what should have staid in Vegas comes knocking at your door some years down the line! OK, this has been fun - but it's time to go diving again! With DEMA beckoning, this writer is off to Fiji and then Las Vegas. Please come and see us at our booth # 1436 where we'll entertain you with wild, toothy and mostly exaggerated stories about our Sharks and our latest killer video edit! Plus, you will have the chance to win an once-in-a-lifetime opportunity by joining our contest! I can't say more but it's surely going to be worth your time, promise! Or join in for drinks, killer steaks -and other happenings that will stay in Vegas- at my very favorite eatery, the unrivaled Palm Steakhouse at Caesar's. Check out this! OK - byebye, hasta and moce mada! 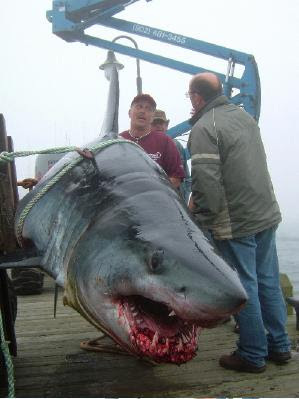 Check out this Shark by clicking on the pics. It was brought up and photographed when jigging for Pakapaka, a prized deepwater Snapper (likely Etelis coruscans) on a seamount in 1,000m of water off the island of Kadavu in Fiji. My knee-jerk reaction when hearing the story was "Silky!" (C. falciformis) - but upon seeing the picture, the first dorsal seems just a bit high for it to be that species. Never having personally seen a Bronzie (C. brachyurus) but having heard about numerous, albeit always unconfirmed "sightings" in Fiji, I was hoping that this could be the first confirmed record of that species for that country. And yet - that caudal keel continues to irritate me! The only Carcharhinid Shark with a pronounced caudal keel I've seen is the Tiger, clearly not the Shark in question. So, quite frankly, I don't have the faintest clue! The tickers have been buzzing with the heroic and successful efforts by rescuers to untangle a subadult Humpback Whale from a piece of Shark net. Rescuers called this Whale rescue the toughest yet, calling into question once again the necessity of the Shark nets. This particular Shark net had gone missing from Currumbin Creek on September 20 and at nearly 2000 feet long and 50 feet deep with a 16-gauge chain, was found wrapped around the young Whale's tail. Shark control gear was introduced in the early 1960s in response to a spate of fatal Shark attacks off Queensland beaches. The gear, which includes Shark nets and drum lines, is in place off 87 Queensland beaches. Ever since, not a single person has been killed by a Shark at a netted beach. Since 2000, 23 Whales have been caught in Shark netting in Queensland and 20 have been successfully freed - alas, however, several have died, too. The stranding of Dolphins, Turtles, Dugongs and Whales in the Shark nets has sparked calls from environmentalists for the nets to be removed. The Queensland Government has long been opposed to the idea of removing Shark nets but comes under increasing pressure during the winter months, when whales make their annual migration from the Antarctic up to the tropical waters of north Queensland. Many of the whales making the return journey south do so with newborn calves, who are often confused by the Shark nets. Up to 11,000 Humpbacks are now making the annual winter migration up the coastline. I'm certainly passionate about Shark Conservation - but this controversy has me a little perplexed, like always when I'm confronted with all-or-nothing positions. On the one hand, I strongly oppose the wanton killing of Marine Life - but on the other, these are some of the most frequented recreational beaches in the world and the nets obviously "work". Whereas some passionately demand the removal, other more pragmatic voices point out that removing an "established" net may entail more then just safety risks. And depending on whether the media carry a report about a Shark incident or a Whale entanglement, public opinion swings back and forth, apparently with no alternatives, solutions or end in sight. Has anybody come up with any alternative safety measures that are both effective and economically viable? Maybe, by tapping into the research of Sharkdefense into magnets or electrochemicals, or the like? Maybe, by using NGO money to fund that research? Frankly, I don't know - but given the necessary goodwill (from both sides! ), I'm sure that reasonable compromises could be found. The good news is that we're not talking about the classic "Shark Killers" vs "Shark Protectors" scenario. What is facing the Conservationists, at least in its overwhelming majority, is not a mob of Shark haters, just a group of people voicing legitimate concerns. It is still a delicate balancing act for the Politicians who are being asked to enact legislation, but at least one could presume that the positions are not completely entrenched. When it comes to the problem with the Humpbacks, maybe this could be a suggestion. Winter is when the Whales migrate and, I assume, the season where only few people go to the beaches for a swim. Surely, there must be data about exactly when the Whales migrate and about the routes they follow. In my experience, most people nowadays react favorably to sensible Conservation measures - with that in mind, could the nets not be removed at least during that period, with signs that explain the reasons being placed on the beaches? Or is this just too trivial? And that, doggone it, brings us to a shout-out for the latest virtuoso of Frontier Baroque, bless her heart, the governor of the Last Frontier. Her reward’s in heaven. A nip at New Smyrna Beach helps Volusia County break its own record by reporting its 23rd Shark bite for 2008. And in Islamorada, a heroic owner rescues his dog from the maws of a Lemon Shark, thus un-busting one of Mythbusters' busts! The "what" is that both locations are in the State of Florida. Correct me if I'm wrong, but that would be the very same State of Florida that decided to enact a Shark feeding ban in 2002, thus putting a grand total of three or so operators out of their unholy business - this of course for the benefit of the poor harassed wildlife and for the safety of the public (and pets!) at large - Right? Yes, Florida, home to the people who gloated and felt "vindicated" when tragedy struck in the Bahamas! And yet, it appears, the numbers aint dropping! And how about Hawaii, the second State to pass such groundbreaking and "eco-friendly" laws? Who are those people that continue to attract the Sharks to the beaches by throwing in bait and chumming the waters? Might those be the very same guys who lobbied to have the Shark feeding ban enacted in the first place? And their trigger-happy brethren? The same people whose "game" Association endorses the killing of Sharks for "sport, fun and relaxation", including a "Royal Slam" for the successful demise of nine species? And "Monster Tournaments" aimed at wiping out the last breeding stocks? The same people who fill websites with detailed instructions about how to mix up a batch of rubby dubby, or chum in order to motivate their prey to come inshore? Yes, to lure them Inshore! As in "Shell bars, grassflats, jetties, inshore cuts and channels, mangrove and grassy points, docks and rocks, ledge dropoffs and similar fishy locations"! So much for Myth versus Reality, eh? Bahamas - Shark Free Marinas! 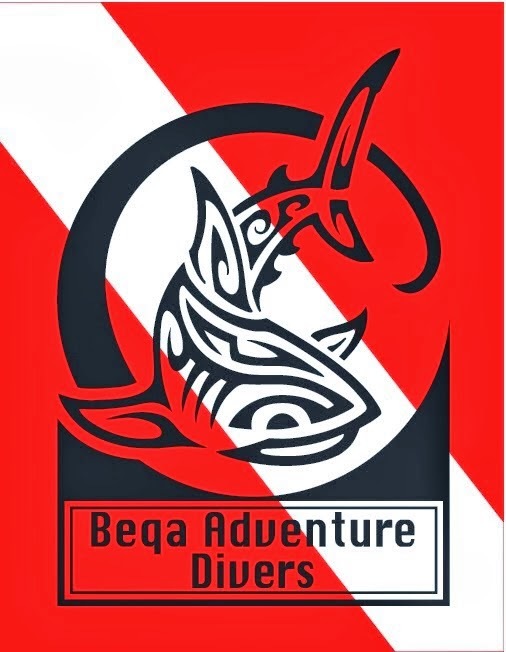 The guys of Shark Diver have started an initiative. "We have decided to act. 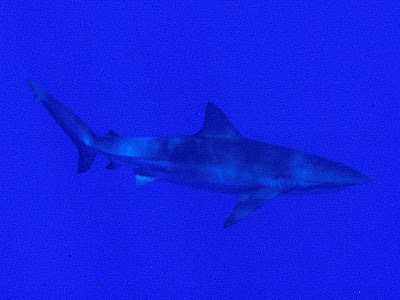 The Government of the Bahamas allows sport fishing for sharks and we fully support sustainable catch-and-release fisheries. However, the taking of gravid female sharks for a one-time photo op and a set of jaws is a senseless waste of a valuable resource. 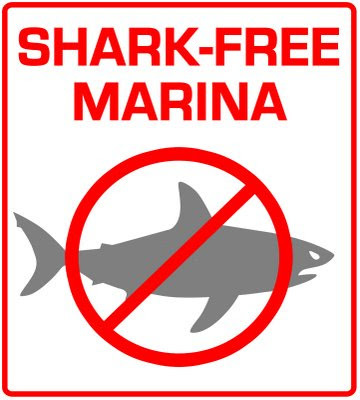 The Shark-Free Marinas Initiative is a way to work with existing resort marinas in the Bahamas that cater to sport fishing vessels, seeking their cooperation in asking them not to allow sharks to be taken and displayed at their marinas. This initiative, in turn, encourages the use of catch-and-release programs and promotes sustainable fisheries. 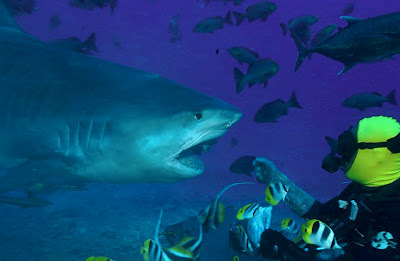 (Name of resort and marina) supports the Shark-Free Marinas Initiative in the Bahamas region. 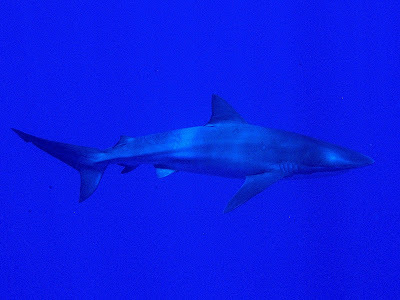 The Bahamas is home to many shark species and the healthy reef systems that support these sharks. We feel the one-time harvesting of sharks for photo images or souvenir jaws is not in the best interests of the Bahamian people or Bahamian tourism. Please practice catch-and-release with all sharks and enjoy our facilities. Editors Note (this being Shark Diver...): This initiative is not only limited to the Bahamas and the several marinas who have expressed an interest in joining it (press release to follow). As a concept we will allow and help promote any organization or group to use this logo to enact their own regional Shark-Free Marinas. In places like Florida and the East coast this could conceivably help redirect shark kills and weigh ins. It offers the opportunity for marinas to claim the "Green Card" while at the same time redirecting fishermen into sustainable fisheries. Special thanks to Richard Theiss RTSea Productions." This Editor says: Well done!!! This is thinking outside of the box at its very best. It creates a win-win situation by promoting a feel-good, green label that could motivate the Marinas to participate in view of the likely positive publicity this would bring about. If one could quickly reach critical mass, it is safe to assume that other Marinas will be compelled to follow suit, if only to avoid becoming the odd man out. Which begs the question, will the Bahamas Dive Association support this initiative and declare all of their Marinas off-bounds for landed Sharks? Will they be at the forefront in trying to convince other Marinas to join in? After all, one would assume that those Dive Operators operate Marinas where fishing plays, if at all, only a secondary role. Instead, they cater to divers who are generally very receptive to Conservation. Their joining would thus be virtually "risk free", without putting any of their principal business at jeopardy but instead, with the benefit of earning plenty of brownie points from their customers. After the infamous and embarrassing weighing-in of their President during the Bahamas Shark Incident controversy (and I spare you the link), they find themselves long on words and short on action. Or have they bothered to pick up the ball when, once again, Shark Diver proposed to have Tiger Beach declared a protected area? And for you out there that may want to do some "prodding": here are the land-based ops, and here, the liveaboards - e-mail and all!